As a property owner, it makes sense to ask questions. At A Better Home Watch, we know that each home presents a unique set of concerns. 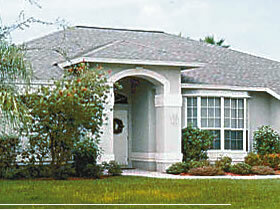 We create a custom plan of security, as unique as each home itself. As a homeowner, you have questions. Here we have tried to compile a list of those questions most frequently asked. Should we turn off the water heater when we leave? Yes, either unplug the water heater or turn the circuit breaker off. There is no need to drain the water heater. How should we set the air conditioner and humidistat? The air conditioner should be set on "cool" and "auto" with a temperature of 78-80 degrees. The humidistat should be set at 62-65% or as directed by the manufacturer. That is the ideal, but frequently not practical. If you must leave it running, it is a great storage place for any foods that might attract ants. Remember to shut off the ice maker. How should we prepare the dishwasher and garbage disposal before we leave? No special preparation is necessary. We will run the dishwasher through a rinse and hold cycle every week to prevent the seals from drying out and to prevent unpleasant odors. We will also run the garbage disposal briefly each week for the same reasons. Should we turn off the main water supply valve? Yes, it is highly recommended. If you have a pool, be sure your pool service company knows where the shut-off valve is. We will turn the water on when we arrive for our weekly check and turn it off again when we leave. Will you monitor service companies such as pool service and lawn care while we are away? Yes, any problems will be promptly reported to you. You should determine before you leave if the pool service company will maintain the water level and your lawn care company should be responsible for trimming trees and shrubs and weeding flower beds. Can you provide referral services if we need work done while we are away? Yes, we have a large resource of contractors and vendors that we have worked with in the past and can recommend as reliable. How can we prevent insect infestations while we are away? Make sure there are no open food containers of any type left in cupboards or closets. Any open food items should be in hard plastic containers or in refrigerator. If you use a pest control service, have them spray inside just before you leave and scatter several ant and roach traps around the house.